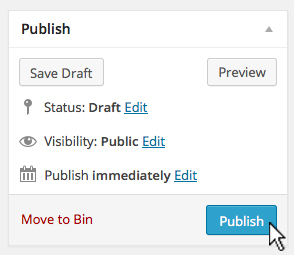 Here you will find some guidance in case you are new to the wordpress user interface. Furthermore you will find a detailed Papergirl manual by Aisha Ronniger, the founder of Papergirl, at the bottom of this page. The Dashboard is the first screen you will see in the backend. Here you will find some resources. You can now choose from the black sidebar menue: Events, Media and Profile. Here you’ll find an overview of the existing events. In case you already created an event and want to work on, update or erase it, you will find it in this list. Here you can create a new event. Enter a descriptive Title (such as “Deadline Papergirl-Berlin”). You can add a suitable Feautured Image for your event in the right sidebar widget. Click on Set featured image and then choose Upload Files. 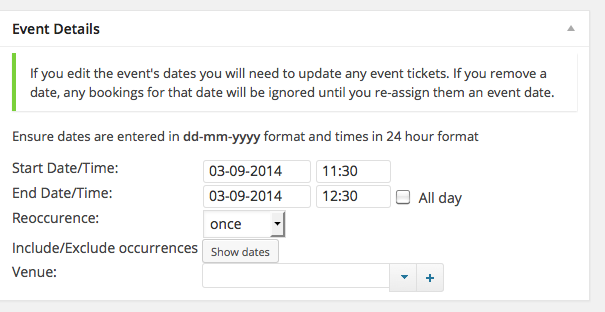 Now you can put a description with further details on your event in the main text area. You can also add further images by clicking on Add Media. The last box where it says Venue refers to the Location of your event. According to the event a Venue can be the space for your exhibition, but also a meeting point in a park for example. If you want to choose from already existing locations use the arrow down button. But if you want to enter a new location with exact address click on the + button. Here you can find a list of existing venues. Here you can see a preview of the complete calendar. Here you find and upload images, but usually it’s easier to add the images directly when editing an event. Here you can add additional information to your profile, change the password etc. If you need further guidance feel free to contact us. 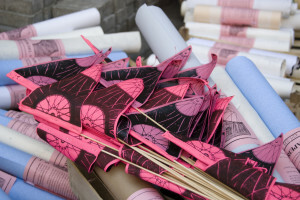 If YOU want to start a PAPERGIRL project in your city, you will find in the following more instructions and a detailed manual – based on the experience of initiating and running Papergirl-Berlin for 5 years. First of all I’d like to explain why Papergirl is non-curated, analogue, non-commercial, participative and impulsive. I have classified this manual following the order of the project into Open-Call, Submission, Documentation, Exhibition, Art-Roll, Workshop, Action, Reaction and Financing. The main event in any case is the distribution of the art. Everything else like the exhibition, the workshop, etc. are indeed shaping the project but are not absolutely essential. Papergirl is a “Do it yourself TOGETHER” project and everyone who wants to join is welcome – no matter what background, age, gender etc.! 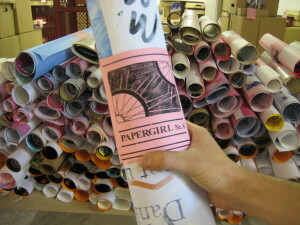 Therefore we call Papergirl participatory. This applies also to the organising side: You will be stronger and have more fun as a team of people with different qualities! In order to reach out to as many people as possible, it is recommendable to open a call, using various channels of media. Every channel of communication awakes the interest of a different audience. Via e-mail, blogs, posters, flyers and word-of-mouth recommendation we tried to approach a vast variety of people. To us it´s about the mixture! A deadline is, of course, of great importance, as most people submit their works usually at the last minute! Normally we had a second internal deadline for all late-comers, but this remains between you and me. The submitted contributions are not selected which brings us to the matter of non-curation. In recent years we were frequently confronted by the question why we wouldn´t make a selection in order to ensure quality! Bearing in mind the streets and street art as the origins of Papergirl, where no one dictates what is shown or not, we certainly did not want to impose on anyone if or what to contribute! 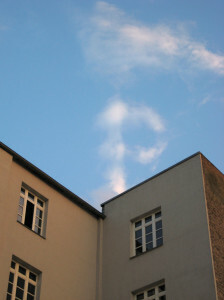 Ultimately it is up to the recipient in the street to decide whether they like it and what to do with the art! 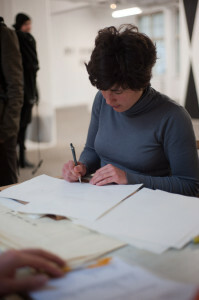 The decision on format, quantity, theme and technique is up to the each participant, as long as the works are rollable! Contributions, however, cannot be submitted by e-mail or as data – i.e. digital. As the works of art are neither printed nor reproduced by the project, but created by the participants themselves, we call Papergirl analogue. The advantage is on both sides of the parties: The project coordinators will not carry additional printing costs and for the artists, the success of each individual artwork lies entirely in his/her hands, which increases the value of their authorship and efforts. Thus, the most diverse works of art come together, such as: Photos, stickers, cut-outs, photocopies, prints and so on. These would lose their value of originals if reproduced and printed like in a magazine or a newspaper. Concerning privacy: If you don’t want to publish your home address online, you can either try to find a partnering institution or location, that is open to receive and collect the incoming mail for you, or you hand out your postal address only via e-mail. If you advice the participants in your call to supply their submission with a name, a contact and a link (if they have), it will help you later on with the documentation, the exhibition and saying Thank You! For coordination, however, it is practical, but it should not be compulsory. Perhaps someone wishes to remain anonymous! I think, an ephemeral project like Papergirl should be well documented. Of course, a video of the event cannot replace the experience, but can reflect the spontaneity and encourage other people to participate! Hence, you should mobilise people ahead of time to help filming and photographing the event. Especially the action is important and particularly difficult to document while riding bike and the fact, that the art is irrevocably gone afterwards! Additionally, we documented the submissions in order to show them on the website and give the artists a platform. However, it would be impossible to document each individual work of art; therefore we photographed one exemplary work of each submission and supplied it with information such as name, home town and a contact/ link (if wanted). The website cannot replace the exhibition but can serve as a general overview and a network. You can also use the gathered material from our past events such as videos and photos, but we would ask you to always add the image or video credits of the authors. When I started Papergirl in 2006 the project consisted “only” of the action. 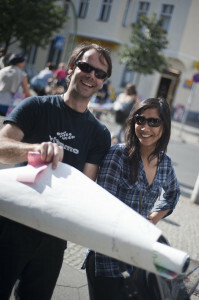 When we met for the first time to hand-out the works, some participants asked: “What´s the other works? Can we open up the rolls again?” My back ache said: „NO, we cannot!” But, of course we did! Since then, all works of art are exhibited before they are distributed. In order to allow every visitor to examine the diversity and variety of each contribution, we hang one exemplary work on the wall and place the remaining contribution beneath it. So the visitors are able to touch and flicker through each piece. The design of the exhibition is mainly a question of money and space. For that reason you will probably have to improvise: We often used disposable packaging materials, e.g. fruit crates, pallets, cardboard boxes, wooden boards, etc. to build up a modular system. To install the art, clips and clothespins have proved useful. We have also used a combination of magnets and steel nails which improved the flexibility of installing a lot. To allow the visitor to relate the works, we attached name plates to each hanging item. As the improvised design of the show was misunderstood by some visitors in the past and they thought the art was to take away, we started adding well visible signs and descriptions of the concept. The desire to own the art is obviously increased by the denial to obtain the same. This phenomenon is well known! What I cannot possess, I want all the more! But it never was the intention to affront someone. It´s all about making unexpected presents to strangers, depending on luck and chance. That is also the reason why route and/or date shouldn’t be published (or at least not to far ahead). In 2010 we divided the exhibition in two parts: before the event and after the event of distribution! After the distribution one work by each participant stayed in the show (like in an “ordinary” exhibition) and therefore, any possible “reicipient” could still visit the show. That is also one of the reasons why we asked the artist to submit at least two pieces of work, but naturally, this is up to you! In order to distribute the art, it has to rolled up first. To avoid getting backache, you should ask some friends and helpers to join. 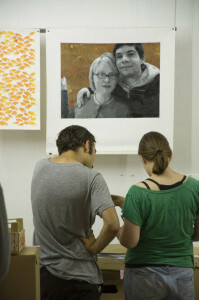 All works – but one of every participating artist – get rolled up. We did this according to the random principle, as each submission consists of a various number of individual items. We place long paper webs on the floor … everyone takes a stack … and then we proceed similar to an assembly line! It is best to start with the biggest or largest pile. We stack approximately five to ten pieces on each pile, but that depends on the “total volume” of contributions. In general, one piece per roll could be sufficient, too. Then we try to ensure a certain balance within the individual bundles by mixing various sizes, techniques and materials. That gives a greater chance of hitting the taste of the recipient. Then we wrap around each roll a banderole providing a short description of the project and means of contact. Small tip: Double sided Velcro has proved a useful breech for this purpose. 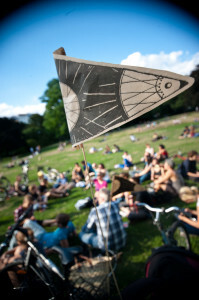 You can download a sample of the banderole-text and also the Papergirl logo here. As the last step, we count and then number the rolls like editions (e.g. 1/100, 2/100…). This makes it clear to the recipient that what they hold in their hand is an original, existing in a limited edition only. As we are now talking about the rolls, I would like to make a short note on the role of gender in Papergirl and this text. When I was asked for the first time: “Is Papergirl only for girls or can boys join, too?,” I was completely stunned. When talking about Paperboys no one asks whether it is just for boys. But this question is explained by our linguistic usage. The majority of words are masculine (at least in German) though they address/include men and women. It is rather unusual the other way round. Since that question I got more and more aware of the peculiarity of language and how it affects gender in our society. I am all for balance and hope that inequality of gender will be of no matter at some point! When my bicycle broke down once again in summer, I thought: This is impossible…. you ride bike all the time, you start this bicycle-project and yet you cannot even repair the brakes of your own bike. Then, on my last visit to New York I saw those amazing “Tallbikes”. Those two things together shaped the idea to start a Bicycle-Workshop. So I went looking for someone who was able not only to repair but also to build bikes. So from old bicycles emerge new art-bikes, which then can be used during the ride! 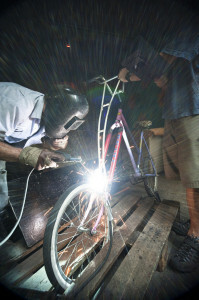 Within 2-3 days, two people are able to build a “tallbike” for instance. It is a completely new feeling while riding and draws a lot of attention in the streets. It´s a bit like a circus! After all, it doesn’t really matter what you produce in the workshop; it’s about doing things together, whether it is printing, painting a mural, or pimping bicycles … no matter what! Now to the main event! Everybody on bicycle can join the ride, no matter if they have submitted art or not. As the action is depending on good weather due to all the paper, we announced the actual date and time to everyone interested short noticed by e-mail. The Papergirls and -boys will then meet at the appointed place, e.g. place of exhibition. Try and make clear (maybe in a speech) that the distribution is about making unexpected presents to others! Naturally, every participant would love to have a Papergirl-Roll, but would that be the case, nothing would be left to distribute! And if only some individuals of the group would get one, that would be quite unfair to the others! Overcoming the urge to own and letting go makes the feat all the greater upon seeing the reaction of a recipient to the unexpected present! This is the priceless gift we get in return! It is great fun to ride in a crowd together, to make noise, to honk, to ring the bells, and to shout… that way any inhibitions are easily overcome. We recommend to always schedule some extra time for people to arrive and get ready. Time can be used to prepare the bikes, install some baskets or fruit boxes, to attach flags or even to oil the rusty chains! With us, the action itself usually did not take more than an hour and the rolls are always gone faster than we would wish! In order not to throw the rolls all at once, you can discuss the route or even distribute a map within the group. It is practical if someone leads the group, otherwise it may get separated. The reactions of the recipients can be completely different, but they have been essentially positive with us. We have placed a contact on the banderole, to give the recipients an opportunity to get in touch with us. As far as I am concerned, I was neither surprised nor disappointed when only few people got in touch with us. You shouldn’t expect a reaction to an unasked bestowal. But some people did contact us and these few were really special! In our society we are so used, that receiving a present means that you are bound to give something in return at some point. Nothing is for free and usually a gift comes at least with some expectations. That’s what I believed to see in many of the surprised eyes: “What do these people want from me?”, and „If I take this, what must I do in return?“ But off we were and the rest is a matter of chance! The first three years I financed Papergirl out of my own pocket and thus it was rather low budget. The location for the exhibition was provided for free and much of the advertising was done in the copy shop – we managed with approximately €100 – 200. As already mentioned, an interesting and inexpensive exhibition can be improvised with materials from the streets. But at some point we wanted some further development. We had formed a team, the expectations, submissions and ideas grew, but were limited by a lack of means! So, we decided to apply for funding and sponsoring. So when I said in the guidelines: Papergirl should be non-commercial, I did not mean, that you shouldn’t try to finance the project in order to raise money for material costs, rent or fees …. I referred to the fact, that the art cannot be purchased and the art-rolls are not delivered to subscribers. The project or the distribution shouldn’t be used for advertising purposes, but rather be supported by cultural foundations or local, related branches. At first I did not like the idea of putting it all into numbers, there was something disenchanting about it. Also, I did not have a clue how to work out a cost plan and never even thought I would have to do something like this! But then, even Papergirl has to grow up some time and I can say we grew up together. First of all, you should find out the requirements for funding. For instance, are you an association (i.e. legal entity) or an informal group or an initiative (a natural person)? Some applications are only permitted for institutions. Before applying you should get a general overview of the deadlines for application! Some applications have to be made six months to a year ahead of the actual start of the project itself. Some foundations have certain periods, some have none; many have several juridical meetings a year – and you have to call to check if it’s worth your while. Many foundations have guidelines to support only projects with social, local or similar components. For the actual proposal, it is important to highlight the proposition and to stress points that might seem perfectly obvious to you. Apart from foundations, you can also seek support from sponsors. You have to find supporters with similar interests who can identify themselves with your project, like local businesses or related companies. The question is, what can we offer to the sponsor and what do we gain. The attraction to the prospective sponsor may be the attention gained by the placement of logos on the website and print media with the potential to reach a certain audience. As closure of a successful distribution we always hosted a party or had a barbecue together! So you can exchange experiences and dance on the adrenalin of your accomplishment! This manual should serve as a support, so that you may learn from of our experiences and so that that Papergirl may remain a non-commercial, uncurated, analogue, participative and impulsive project! We wish you great success and fun!